If you’ve lost all of your natural teeth, whether from periodontal disease, tooth decay or injury, complete dentures can replace your missing teeth and your smile. Replacing missing teeth will benefit your appearance and your health. Without support from the denture, facial muscles sag, making a person look older. You’ll be able to eat and speak – things that people often take for granted until their natural teeth are lost. An immediate complete denture is inserted as soon as the remaining teeth are removed. We make models of the patient’s jaws during a preliminary visit. 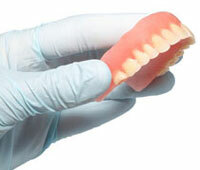 With immediate dentures, the denture wearer does not have to be without teeth during the healing period. After complete healing a permanent denture will be made and fitted. Don’t wait! Recapture your smile and eating ability and start enjoying life again. Call for an appointment with Dr. Drahota today.